Just as vital as having a sunscreen on when cycling, hiking, or running out in the sun, a good pair of sunglasses is required to shield your peepers from the harmful UV rays produced by the sun. Eye cancers, cataracts, keratitis, and macular degeneration are just a fraction of the conditions triggered by too much exposure to the ultraviolet light. Throw in dust, wind, and blinding due to the excess glare and things get even worse. So, does this mean you should avoid doing your usual jog on a midsummer day? Not if you rock a pair of sporty sunglasses. Eyewear is an essential part of sun protective clothing and will not only keep your eyes guarded but also give you better vision when the light is overly bright. Here are the 10 best sport sunglasses and a guide to help you choose the right pair. All our picks combine protection and comfort to keep your eyes safe and appreciative of the time you spend outdoors. If you live an active life and looking for sunnies that provide maximum eye shield against UV light, then DUCO Polarized Sunglasses will be a great choice. With TAC polarized lenses, these adorable men’s sport sunglasses are able to block out 100 percent of UVA and UVB up to 400 nanometers. The lightweight, scratch-resistant, and highly durable lenses are perfect for all outdoor activities. 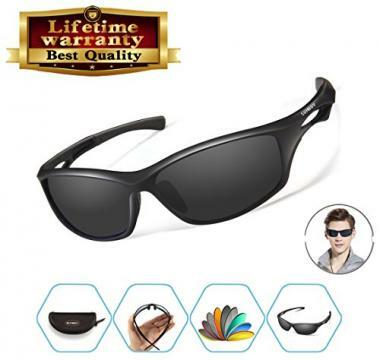 Also, the fact that these are polarized sunglasses means that you will be able to minimize glare from road pavements, snow, water and other reflecting surfaces, improving your vision. The aluminum and magnesium alloy frame used in these shades is very light that you will even forget you have something on your face. You can bend the frame to fit your head snuggly so it doesn’t slip off when you begin moving. These sunnies are great to use with a helmet too. The temples slip easily under the straps without rubbing your skin. 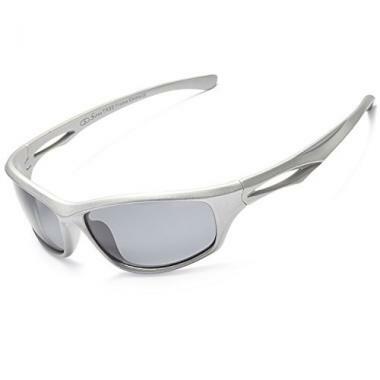 The Hulislem S1 Sport Polarized Sunglasses are a stylish and extremely lightweight pair. Whether you are going on a hiking or backpacking trip, taking your surfboard for a spin, or just cycling about, these shades will give your eyes complete protection against the harmful UV rays. The lenses are designed with an iridium mirror flash coat that reduces glare and keeps the UV wavelength responsible for damaging your peepers at bay. The specially designed O Matter frame makes the glasses tough enough to handle any sport thrown its way. Not forgetting the highly advanced AcuTint coloring technology that enables you to see natural colors undistorted. These active sunglasses are great for both men and women. They balance the amount of light reaching your eyes, providing maximum comfort. RIVBOS is yet another leading producer for the best sunglasses for sporting activities. 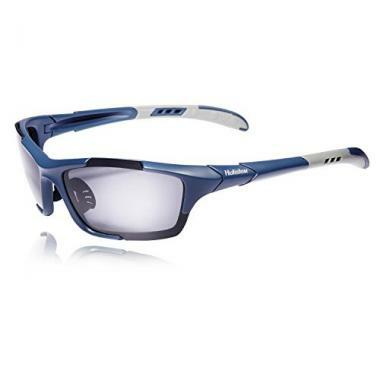 If you are looking for a pocket-friendly eyewear that will serve all your active lifestyle’s needs, then this is it. As the name hints, RIVBOS Sports Sunglasses are 100% polarized and come with remarkable lens clarity that keeps your eyes UV rays-protected throughout your outdoor workouts. Their wraparound design ensures that they sit snugly around your face and stay on when you run, ski, snowboard, cycle, hike, fish, or go boating. The TR90 material used on the frame is flexible, exceptionally sturdy, and unbreakable. 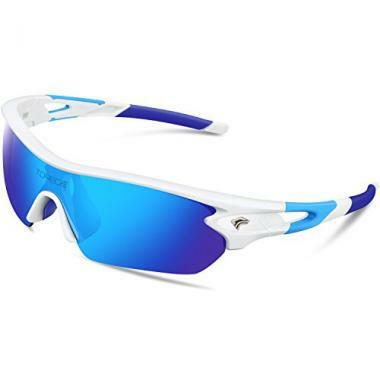 Torege Polarized Sports Sunglasses make their way to our top rated sunglasses for sport because they come with not one, not two but five interchangeable lenses that you can use for night activities, driving or running on reflecting surfaces, or performing other outdoor workouts. Constructed with superlight, durable, and stylish frames and lenses, these shades are scratch and impact resistant, strong, and unbreakable. 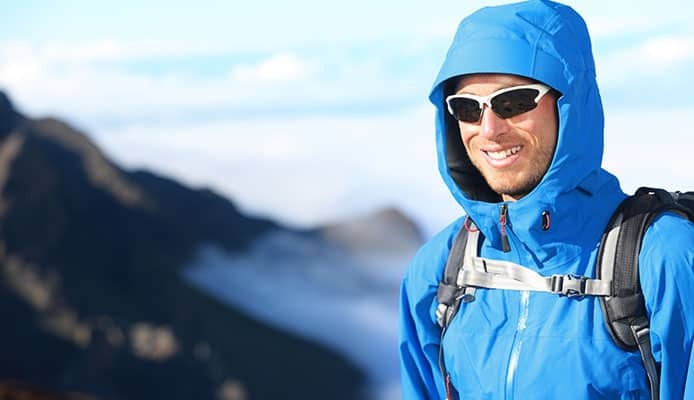 They can serve as racing, fishing, skiing, mountain climbing, and hiking sunglasses, to shield your eyes from the glaring light and damaging UVA and UVB rays. The soft rubber nose pads get the sunglasses sitting comfortably on your face. The polycarbonate design makes Duduma Polarized Sports Sunglasses one of the lightest and most comfortable in the market. Getting a pair will give your eyes the protection they need against ultraviolet rays, dust, strong winds, and branches on the way. Owing to the durable material used on the lenses and frames, these specs are totally scrape resistant. 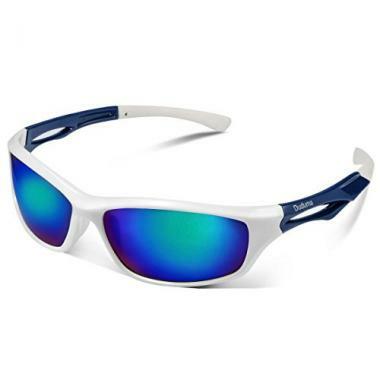 If long boating or fishing hours under the scorching sun is your thing, then Duduma produces the perfect boating and fishing sunglasses and a pair would be ideal for a day out on the water. The polarized lenses offer all-round UV rays and glare protection and will stick to your face like glue. Looking for sport sunglasses brands that design night eyewear? Then ATTCL could be where your search ends. 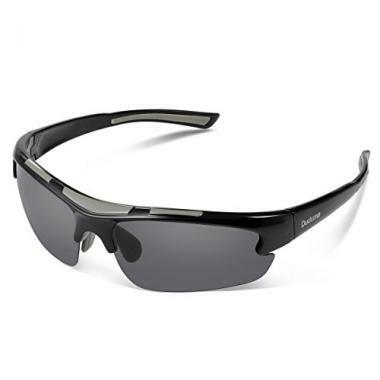 This particular model is one of the best sunglasses for sport in terms of reducing night glare. The high quality polarized lenses that these spekkies come with are excellent for improving night vision, visual definition, and color quality as well as minimizing glare from sharp reflections or oncoming vehicle headlights. ATTCL Driving Sports eyewear also provide 100% UV rays blockage during the day, balances colors, and restores image accuracy. You probably have worn sunglasses that black out the sun completely, right? Well, Duduma Polarized Designer sunnies have a light to moderate TAC polarized filter. Yes, they will reduce the glare, but not darkness like many sunglasses do. 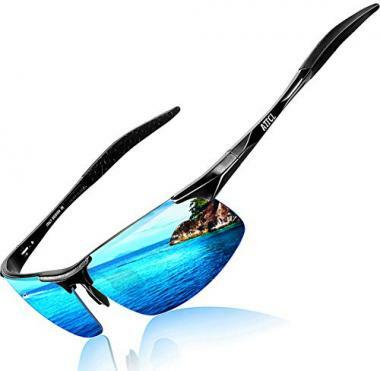 These trendy trekkers, bikers, water sports lovers, and athletes sunglasses provide maximum sun shield and strong appeal. With durable and unbreakable frame that fits nicely on your head, you can go about your activities without worrying about your glasses slipping or falling off. RIVBOS polarized sport sunglasses will get you protecting your eyes, eliminating scattered and reflected light, making the scenery clearer, and restoring true color with five different lenses. However, only the black lens is polarized. The yellow, blue, and clear lenses are designed for night activities, beach games and sports, and windy weather respectively. The highly durable TR 90 frame is lightweight and super flexible, which gets the glasses fitting your eyes properly when you drive, cycle, or perform other outdoor activities. Want to evoke the summer and spring spirit in style? Then this pair of sunglasses from SIPLION could be all you need. Whether you are on a beach picnic, meeting up with friends at the café across the street or just taking a run, these elegant sun cheaters will keep your eyes stylishly safe. 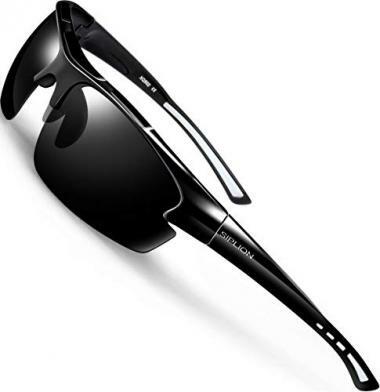 SIPLION Sunglasses offer absolute protection against UV rays. The high quality polarized lenses reduce glare and block intense light when you go about your outdoor activities. With lightweight, durable, and stress-resistant TR90 frames, these spekkies are hard to break and will fit you nicely to offer all-day comfort and safety. 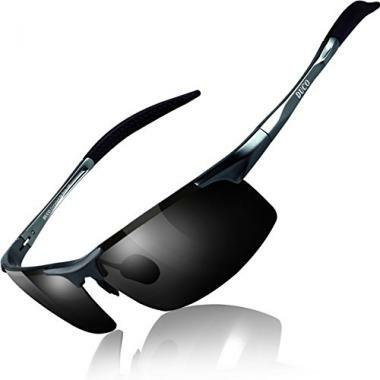 Of course, our sport sunglasses reviews won’t be complete without the gorgeous Siren Polarized Sports Sunglasses. Don a pair and say Adios to squinting when fishing, riding your kayak, driving, or cycling. Designed with high quality lenses that reduce the glaring light, you will have a clear vision even on the sunniest days. You have 21 colors to choose from, all featuring TR90 unbreakable frames and triacetate lenses that provide maximum ultraviolet rays protection. UV protection and level of comfort are definitely some of the major factors to consider when buying sporty sunnies. Here are more features that will help you land the best sport sunglasses for your active days. The lighter the sunglasses, the more comfortable you will be. If you are performing an activity where weight matters, then you will need a lighter frame. The standard plastic frames will be a less expensive option but heavier and less aerodynamic. Acetate frames are stronger and rather lightweight. Do you want to do glass or polycarbonate? Glass lenses are clearer, but polycarbonate ones are less likely to break if you fall. Either way, your lenses should be able to reduce glare, protect you from UV radiation, and enhance visibility. 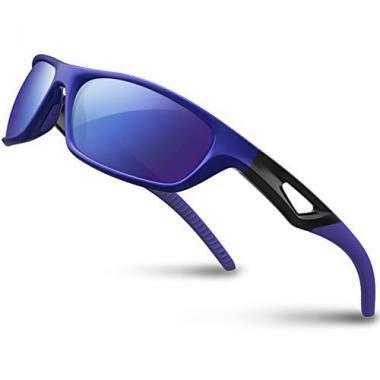 Most men and women’s sport sunglasses today come with polarized lenses that offer these features, so it shouldn’t be difficult to find the perfect pair. If you will be using your spekkies for driving, paddle sporting, or as sailing sunglasses, then you need a polarized lens to cut down on glare. For athletes who play golf, baseball, competitive shooting and such like sports, tinted lenses may come in handy. These will not necessarily block out more sun but will increase contrast and clarity, which is important for such activities. Bigger is better. More coverage means less damage to your eyes. Wraparound-style or oversized sunglasses will help block UV light entering your eyes from the sides. Just make sure they fit you snuggly so they don’t slip or fall off when you start getting active. What your pair of sunnies is made from has a major effect on its weight, clarity, durability, and cost. Pay close attention to the material, as this will help you know if the set is going to serve the purpose you intend it to. For intense activities like running, swimming, and some canoe and kayak adventures, consider lightweight material like shatterproof plastic. But if you are just looking for something to rock on your next coffee date, there will be no harm in trying a style that incorporates heavier materials. Sunglasses need not to cost a fortune to serve the purpose. A less expensive pair marked as 100% UV-protection could be just as functional as a pricier option. Q: Why Choose Polarized Sports Sunglasses? A: Polarized eyewear reduces the glare caused by reflective surfaces like pavements, water, and snow. Sure, polarization will not block out UV rays, but it will make driving, waters porting, skiing, and such like activities safer and more enjoyable. Q: How To Care For Polarized Sunglasses? A: Use soapy water or neutral detergent to clean. Then get a clean soft piece of cloth and gently wipe dry. Never clean polarized sunglasses with seawater or paper towels. Q: What To Do If The Lenses Scratch? A: Most of the brands listed above offer lifetime breakage warranty on lenses and frames. Minor lens scratches, however, can be easily fixed at home. Just get a soft wool cloth and rub non-abrasive, non-whitening toothpaste onto the scrape in a circular motion. Massage the spot for about 15 seconds. Then rinse off the paste with cool water and wipe dry. Sport sunglasses are a vital piece of outdoor gear and will get you reaping some of the most notable benefits of UV protective clothing. Our top sport sunglasses above will give you maximum protection against the damaging ultraviolet rays, minimize glare, and improve your vision. But you need to choose the right design to get the best value for your money. And once you have purchased a pair that matches your needs, be sure to care for it so it can give you a longer service.